Activism on the Edge of age was a two-day event organised by the Connectors Study and hosted by the Centre for Innovation and Research in Childhood and Youth (CIRCY: Childhood Publics stream) in June 2016 . The workshop brought together an interdisciplinary group of researchers working on activism broadly defined from the perspectives of ‘the everyday’ and the life course. Nolas, S-M., Varvantakis, C. & Aruldoss, V. (2017). 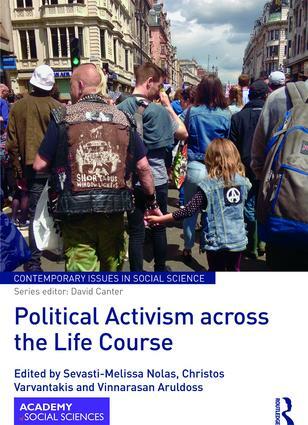 ‘Political activism across the life course’, Contemporary Social Science, 12(1-2), pp.1-12. DOI 10.1080/21582041.2017.1336566. Open Access. Nolas, S-M., Varvantakis, C. & Aruldoss, V. (2017). ‘Talking politics in everyday family lives’, Contemporary Social Science, 12(1-2), pp.68-83. DOI: 10.1080/21582041.2017.1330965. Open Access. Nolas, S-M., Varvantakis, C. & Aruldoss, V. (Eds) (2018). Political Activism across the the Life Course.